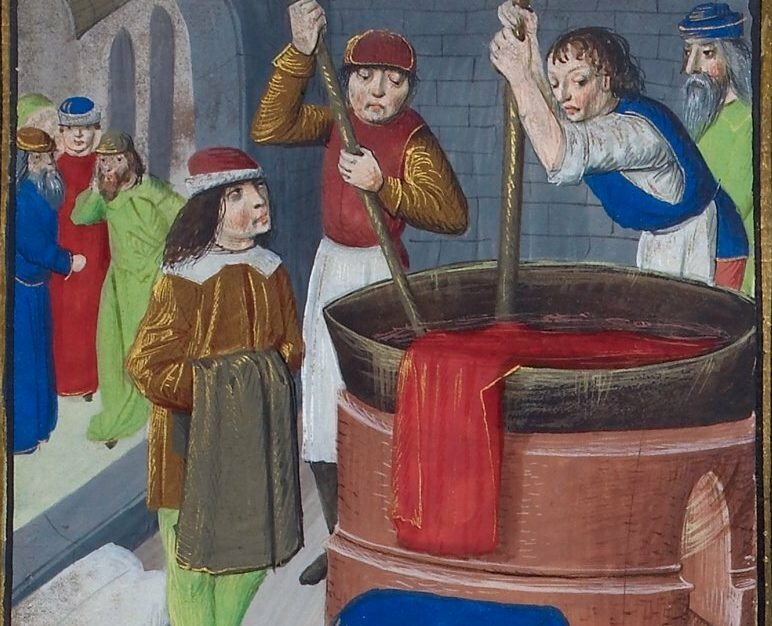 What was work really like in the Middle Ages? I am the author of the first book in a series that will be answering this question, looking at different occupations, trades and professions. I look at the medieval clothier, and his (or occasionally her) work in both the making and marketing of cloth. It’s the most complete modern survey of the trade that formed the backbone of late medieval England’s economy, examining how it shaped society and the landscape and offered employment throughout the country. Clothiers were the entrepreneurs at the heart of the cloth trade which became England’s leading industry in the late Middle Ages. No other industry created more employment or generated more wealth. As many as 1 in 7 of the country’s workforce were probably making cloth and 1 in 4 households were involved in spinning. Cloth-making required several different processes. Wool was selected and sorted, and carded or combed before being spun into yarn. Yarn was then woven into cloth on a loom. The wool or cloth was often dyed using expensive imported dyestuffs. The cloth was fulled, to cleanse and thicken the fabric, by pounding underfoot or by hammers powered by a water mill. It was then attached to wooden frames with tenterhooks to be dried and stretched, before undergoing finishing processes. We still use terms from cloth-making in our everyday speech, when we talk of being ‘dyed in the wool’ or ‘on tenterhooks’. Weaving on a loom. British Library Egerton MS 1894, fol. 193r. Initially, cloth-making was carried out by individual craftspeople. Increasingly though, clothiers co-ordinated these processes through what historians have called the putting-out or domestic system. Clothiers put-out raw or semi-processed materials to spinners, weavers, fullers and other cloth-workers, who returned them after completing their work. A few clothiers even established centralised production in buildings which we might describe as factories. William Stumpe of Malmesbury, John Winchcombe of Newbury, and a handful of other clothiers brought together the different processes of cloth-making on a large scale at a single site. Clothiers also arranged the sale of the finished cloth. Visiting town markets and fairs, they negotiated with merchants from London and occasionally even from overseas. Consequently clothiers needed a range of technical knowledge, from buying wool to dyeing, as well as marketing skills. Throughout the cloth-making process they had to monitor quality and ensure that products were completed and delivered on time and at an acceptable cost. The clothier emerged in different regions at different times. The English word clothier, used interchangeably with cloth-maker and cloth-man, first appears in literature in the late fourteenth century and in the catalogued plea rolls in the early fifteenth century. Cloth-making centred on a few major towns in the 1350-1400 period, notably Colchester, Coventry, Norwich, Salisbury and York. Entrepreneurs engaged with several aspects of cloth production in these towns, sometimes supplying raw materials, sometimes employing cloth-workers, and usually selling finished cloth. The clothiers had their origins in these entrepreneurs. During the fifteenth century, cloth-making largely moved out of these major towns into smaller urban centres and the countryside, and clothiers became increasingly responsible for production. The clothier seems to have emerged first in Somerset, and later in Suffolk and Kent. Like the modern-day entrepreneurs of Silicon Valley, medieval clothiers tended to be concentrated in particular communities. With their clusters of clothiers, east Somerset, west Wiltshire and Gloucestershire, the Stour Valley of north Essex and south Suffolk, and the Kentish Weald, were three particular ‘Silicon Valleys’ of entrepreneurship in the late medieval cloth industry. In these locations, clothiers had ready access to labour, capital and markets, particularly through the networks of London merchants. Clothiers and cloth-workers transformed the landscape. A few clothiers were able to amass great wealth, which they used to enrich churches and construct lavish mansions, which can still be seen today. Lavenham in Suffolk is now a village of less than 2,000 inhabitants, but in 1524 it was the fifteenth wealthiest town in England, thanks to the profits of the cloth trade. The total tax contributions paid by its residents, particularly Alice Spring, widow of the wealthy clothier Thomas, placed Lavenham above prominent towns such as Gloucester, Yarmouth and Lincoln. At least thirty-five donors with links to the cloth trade left bequests to the parish church, including three generations of the Spring family of clothiers. Thomas Paycocke’s house at Coggeshall, Essex was built to impress in 1509-10 with its stunning woodcarving and elaborate panelling. It is now a National Trust property. The carvings still display Thomas’ initials and the merchant’s mark with which he branded his cloth as a sign of its quality. Thomas left bequests in his will to ‘my weavers, fullers and shearmen’. He gave additional sums for those ‘that have wrought me very much work’. Clothiers also enlarged, enriched, or rebuilt parish churches to inspire prayer and remembrance after their deaths. John Lane’s chapel in the Devon church of Cullompton has an external inscription with the date 1526 asking the reader to remember with prayers the souls of John and his wife Thomasyn. The chapel is also decorated both inside and out with symbols of John Lane’s wealth, including ships, cloth shears and angels holding teasel frames, used in the cloth-making process. From individual unskilled workers to hugely successful entrepreneurs, and from limited local production to international import and export and some of the very earliest factories, the cloth trade encompassed them all. The medieval clothier was at the forefront of an industry that transformed parts of England during the later Middle Ages and left legacies to their communities that can still be seen today. The Medieval Clothier, published by the Boydell Press, is the first in their Working in the Middle Ages series. Click here to learn more about the book. John S. Lee, the author of The Medieval Clothier, is a Research Associate at the Centre for Medieval Studies at the University of York. Click here to visit his Academia.edu page.